Are you looking for a delicious recipe with a difference? If you are, you’ve found it! 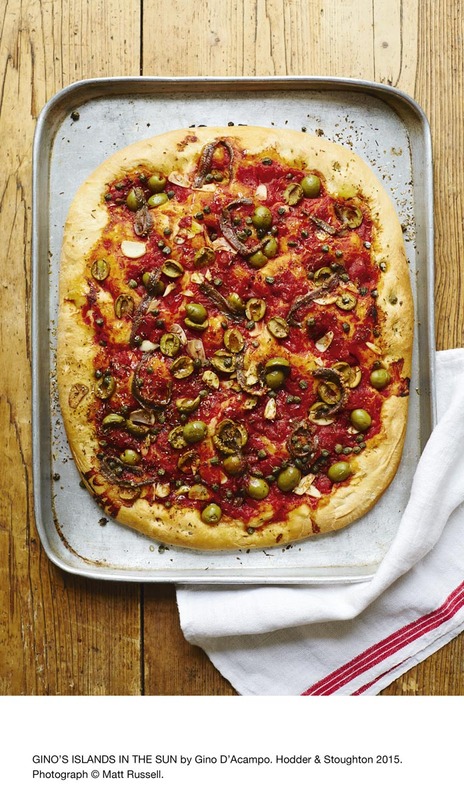 Here’s my deep pan pizza with anchovy, olive & caper topping for you to enjoy. Sicily is the original home of the deep-pan pizza. A popular dish, it is usually cooked in large rectangular tins and sold by the weight. Pizzas in Sicily vary according to the region, with each area having its own recipes and traditions, and this type (known in Sicily as sfinciuni) originated in western Sicily, in the province of Palermo. I absolutely love the combination of anchovies, olives, capers and garlic in this topping. 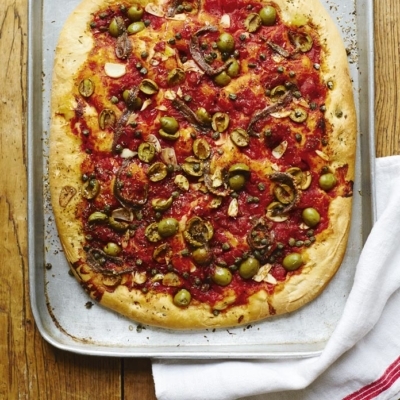 Feast your eyes on the finest deep pan pizza with anchovy, olive & caper topping! It’s straightforward and fun to make this great dish. Simply follow the instructions below and get the perfect result. Place the flour in a large bowl. Add the yeast to one side of the bowl and the salt to the other. Make a well in the centre and add 3 tablespoons of the oil then gradually pour in 300ml warm water and mix together using the handle of a wooden spoon. Knead the dough on a lightly floured surface for about 10 minutes or until soft, smooth and elastic, adding a little more flour if it’s really sticky. Shape the dough into a round and place on a large oiled baking sheet. Brush the top with a little oil and cover with a clean tea towel. Leave to rise in a warm place for 1 hour or until nearly doubled in size. Remove the tea towel. Using your fingertips, gently push the dough to a rectangle about 30 x 24cm and 2–3cm thick and make indentations in the dough. Brush with a little oil and replace the tea towel. Leave to rise again in a warm place for a further 40 minutes or until nearly doubled in size. Meanwhile, preheat the oven to 220°C/gas mark 7. Remove the tea towel and make further indentations in the dough. Spread over the chopped tomatoes, leaving a border of about 1cm clear around the edges. Scatter over the anchovies, olives, capers, garlic and oregano. Drizzle with the remaining oil. Bake for 20–25 minutes or until golden brown. Transfer to a wire rack to cool slightly. Serve warm. Once you’re done, simply sit back and enjoy your deep pan pizza with anchovy, olive & caper topping and don’t forget to check out other great authentic Italian recipes including great antipasti recipes, Italian pasta recipes, Italian soup recipes, Italian beef dishes and authentic pizza recipes.